The Atlantico Shopping Centre (or in Spanish, "Centro Comercial Atlantico") has been chosen by us as the BEST shopping centre for 2011-2018. It is only 15 minutes drive from Maspalomas & Playa del Ingles. We feel that the quality of the shopping experience is really world-class here. This has been kept up to world class standards since it opened, and that is why we recommend it. What can we find there? Over a hundred quality shops and free parking space for over 2000 cars. The total area is 127,000 square meters, distributed in two floors. We have a very big Carrefour hypermarket which has a huge selection of items at great prices, and also smaller shops like Zara, Mango, a Santander bank, etc. 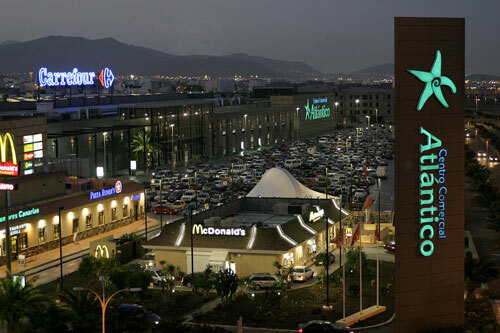 There are also good restaurants and fast food ones like McDonald's (actually there are two McDonald's one is inside in front of Carrefour, and the other one is outside, it is a drive-through, in the parking lot, so you can get your burgers without getting down from your car). If you don't have a proper internet connection at your hotel or apartment, you can buy a SIM card from the Yoigo stall or the Phone House shop. There is a big sign outside the Carrefour hypermarket, where they explain the delivery charges, phone ordering, their single queue system, and their facilities and accessibility for the disabled. 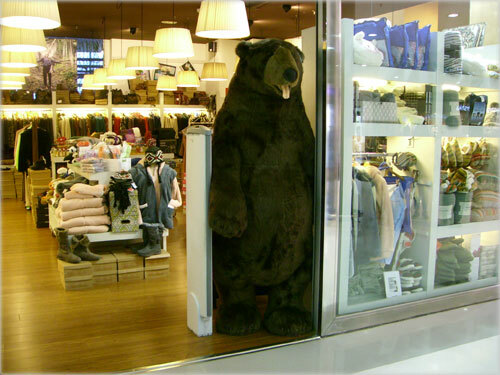 The "Natura" Spanish franchise shop has a friendly big bear at the entrance. The management of this shopping centre is extremely active and creative, and organizes different activities every month. For Christmas of 2013 they have organized lots of things for kids and grown-ups who are shopping at the mall. A huge Nativity scene has been set up on the top floor, for everyone to see. Click here to see the photos of the Nativity scene displayed in this shopping mall and read about the Christmas events. The management of this shopping centre is extremely active and creative, and organizes different activities every month. For Christmas they organize lots of things for kids and grown-ups who are shopping at the mall. A huge Nativity scene is set up on the top floor, for everyone to see. Click here to see the photos of the 2013 Nativity scene displayed in this shopping mall and read about the Christmas events. By Taxi: Hop onto the taxi and say "Atlantico!!!" By Car from the south: Get on to the main motorway towards Las Palmas and get out when you see the word "Area Comercial -Vecindario" and a shopping cart logo. - From Maspalomas: lines 01, 04, 05, 90 . Bus line number 90 is the BEST option because it leaves you right at the door. 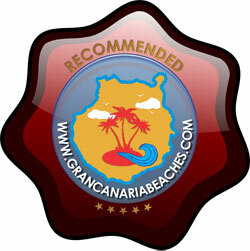 Click here to see an updated schedule from Maspalomas & Playa del Ingles (opens a new window). Buses that go up to playa Amadores are shaded gray in the schedule. Summer sale starts on July 1st and lasts till the end of August; winter sale starts on January 7th and lasts till the end of February. Best days for shopping: Mondays to Thursdays. Fridays and Saturdays are quite busy. Free parking is available for the disabled. These parking spaces are painted blue. Parking spaces for pregnant women are painted red. Both types are conveniently located near the entrance. We have seen police giving tickets to the wrongly parked cars, quite a few times, when drivers (who are neither disabled nor pregnant, and too lazy to look for parking) place their cars in the special parking spots. If you don't get parking on the top, there is more underneath, and if you still don't find, you can park on the street, but it is extremely rare to find this shopping mall's parking 100% full. Free Wifi internet connection is available throughout the whole centre. Plenty of taxis are always available. The taxi stand is right in front of the main entrance.